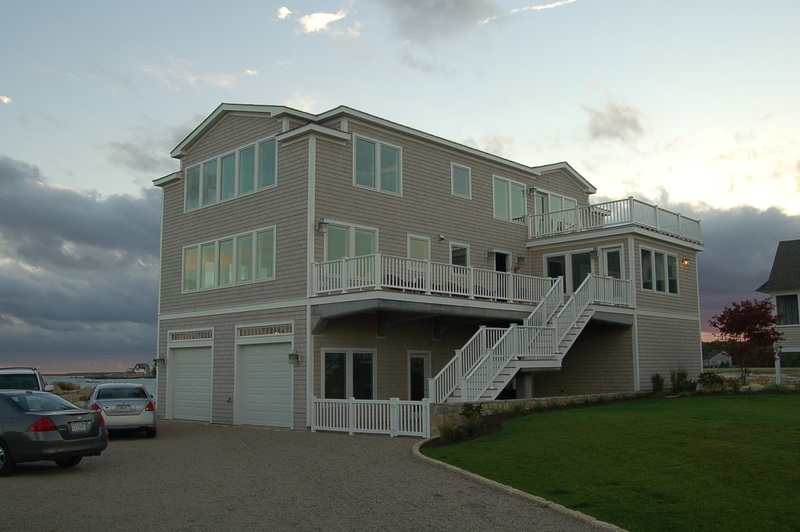 We moved into our new house in Mattapoisett in June of 2007. We were enjoying the post 9/11 stock market boom and as I said, the Whaler was becoming highly unreliable. I had become a regular on thehulltruth.com and had literally spent the last 2 years picking out the next Horne boat. All the offshore boys liked Yellowfins and Regulators. I did too, but they were a little more money than I wanted to spend and there weren’t any dealers nearby. 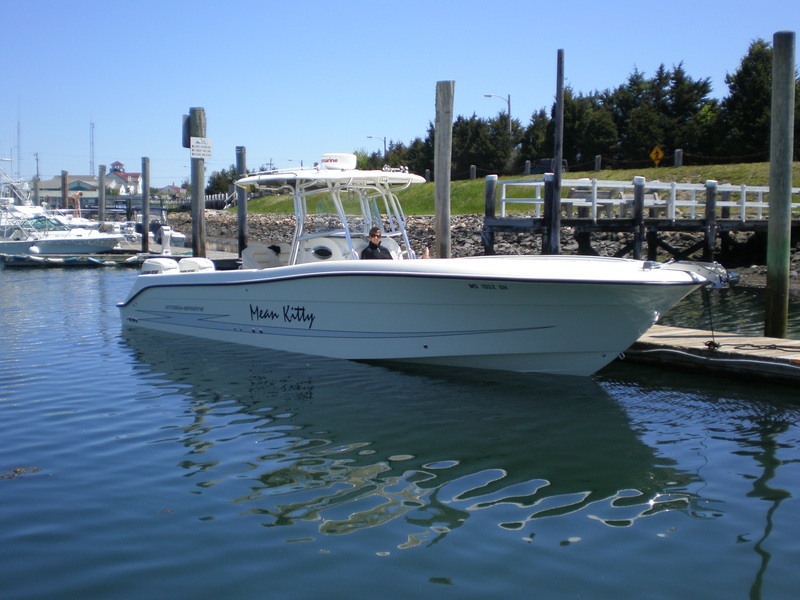 I discovered Hydrasports at the Newport Boat Show where I met Ocean House Marina. I figured out that the Whaler wasn’t a Buzzards Bay boat the hard way and I wasn’t going to make that mistake again. I was not going to buy a new boat again without a seatrail in rough seas – easier said than done! Hats off to Ocean House, they had a 2900CC at the show and agreed to give me a seatrial if I could make it to their place Monday morning before they hauled the boat after the show. If you boat out of Lake Winnipesaukee or even the inside of the Cape, you probably don’t need a seatrial. But if you call Buzzards Bay homeport, you absolutely must get a seatrial. I loved Mike and Heidi as soon as I met them. Mike is as straight a shooter as they come. I’m not sure how he prices his boats, but the quote he gave me for the 29 was way under “sticker”. In fact, it was less than pretty much all of the used 29’s on the market. He also volunteered to sell my Whaler and if it sold before my new boat came in, he’d write it up as a trade-in to help me save sales tax. All was good until Mrs. Horne discovered that Hydrasports also made a 33′ center console. “If we’re getting a new boat, why just move up three feet? I want the 33.” she said. Mike gave me a quote for the 33 and it was only about $25,000 more. Ocean House pushed Yamaha’s and the 250’s were perfect for the 29. Mike sold Yamaha’s as well, but he said the 250’s weren’t powerful enough for the 33 and the 350’s were too heavy. He said the ETEC’s were lighter and really were fine for a 33. He also arranged for a seatrail on a 33 with 250 Etecs. It ran okay, but topped out at about 40 MPH, which was slower than the Whaler and after the Thunderbird, I wanted nothing to do with an underpowered boat! While I was still researching, Evinrude announced a 300HP V-6 which weighed hundreds of pounds less than big Yammies. They had already tested it and it topped out at 52 MPH. That sealed the deal for me and the order was placed for Mean Kitty. We took delivery Memorial Day Weekend of 2008. As big center consoles go, she was a nearly perfect day boat for Buzzards Bay. She did do 52 MPH with the original props, but the torque was a little flaky and after the first season, I swapped them out for a set that didn’t top out quite as high, but held plane over a longer range of speeds. Mean Kitty was a very exciting boat in that she only had two speeds — fast and really fast. In fact, many times I’d be just on plane at 33 MPH and look down and see my mileage had dropped to 3/4 mile per gallon. I bump it up to 38 MPH and it would actually run more economically. 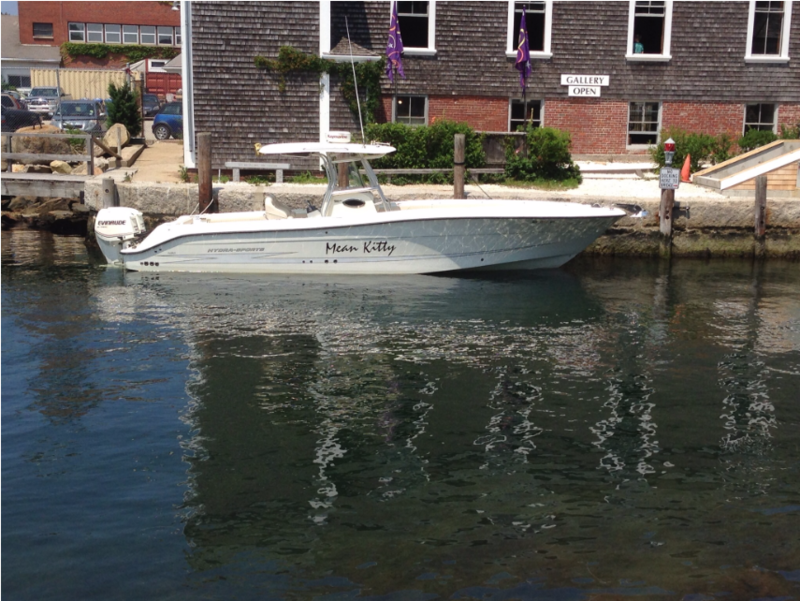 Yesterday I took my new HS 33 down the Cape Cod Canal for lunch at the Aqua Grille and gas for Kitty ($4.50/gallon). Anyway, great ride down the canal (from Buzzards Bay) and lunch was delicious. We headed back around 1:30 and that’s when the fun began. Before we got to the Sagamore Bridge we encountered 3′ chop. I had to ignore the 10 MPH speed limit and hit the throttle to keep everyone from getting wet. I’ve never seen this before. The canal is well guarded and there weren’t any big boats churning up chop. Once I got past the 10 MPH sign, I took it up to about 30 MPH and headed into the abyss. It was quite surreal as we took that 1-2 mile run out into Buzzards Bay; as the waves steadily grew from 3 – 5 footers to bigger. On both sides of us we saw boats of all sizes turning around and heading back. Just before we cleared the sand bar we passed a 50′ sportfisher that was struggling to hold 20 knots into the sea. Now we’re all alone and every wave is at least 6′, very short cycle, very steep faced, and coming from multiple directions and the stereo is playing Toby Keith’s Whiskey Girl loud enough to drown out everything else. We’re jumping around, but staying in the water. I remember everyone’s advice to hold my speed, so I’m still doing close to 30 MPH into these 6 footers. Then from nowhere jumps a 12 footer. It breaks over the bow (which is riding high) and over the windshield and tee-top. Enough water is forced through the 6″ slot between the top of the windshield and the bottom of the tee-top to completely drench everyone from head to toe. It felt like we hit something, I looked down at the instruments and the engines were revving over 5000 RPM and our speed was dropping. I’m not quite sure what happened with the engines, but I simply powered down and powered back up and everything went fine. As it turned out, that 12 footer was the last of big canal chop and we quickly found ourselves back in 3-5 footers doing 35 MPH again. So, that’s the limit (for Mean Kitty anyways) that you might expect out of a 3300CC Hydra Sport. The wind was only blowing around 20, so those waves were tide driven, not wind driven. High tide was at 10:30 AM and low was around 4:15 PM. We hit the abyss around 2:00 PM. She was a great boat. but because she was open and wanted to run so fast, she was pretty much a 4th of July to Labor Day boat. By 2014, we were all getting older and more or our friends seemed to be getting queasy running around the Bay at 40 MPH in 3-5 waves.